Oak dining tables offer the best value for your money as they are both elegant, ergonomic and long lasting. This is the reason they happen to be in huge demand. However, since they have traditionally been less attractive compared to their glass counterparts, customers have always been looking for new models and varieties to spend their hard earned money on. 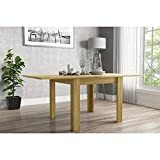 Below is a diverse collection of oak dining tables from different online furniture stores in the UK for your consideration. Of all the most basic pieces of home furnishing, a dining table is often the most difficult to select. It needs to suit the style of the room and the taste of the homeowner, but it must also be durable and comfortable. Though in recent decades other materials have become briefly popular, most people still prefer a wooden table. Oak dining tables have remained popular for centuries, with good reason. 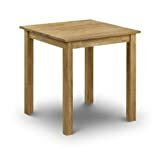 Adaptability is a key factor when choosing a table, and oak is one of the most adaptable of woods. Unlike mahogany, which is most suitable to a very formal design, or pine, which is strictly casual, the rich grain of oak lends itself to almost any style. It can be used with a darker stain for an elegant, Victorian look. It is equally at home, with a lighter finish, in an ultramodern design. The “look” of the wood itself is incredibly versatile. Since oak is a hardwood, it is extremely durable. It will stand up easily to the wear and tear of daily use in a family home (just think of kids, no matter how well behaved, banging their cups on the table). It is usually stain resistant and is less likely than softer woods to suffer from dents and gouges. As with any piece of furniture, the buyer will want to consider a few things carefully when buying oak dining tables. Construction is especially important. Remember that a dining table sees daily use. No one imagines jumping up and down on a table, of course, but your table sees constant use. Most people don’t just use their table three times a day: it’s probably going to be a place where the family gathers to eat, but also where the kids do homework and where adults do anything from work spreadsheets to a painting project. Make sure that the table can keep up with this kind of use. Look for solidity of construction: anything held together with nails or staples is NOT something that will hold together well. If glue has been used, it may be okay, but is probably not of the highest quality. Table comes in lovely light wood tone colour, called oak sonoma. This furniture has been made out of high quality materials like MDF and it has been vinyl wrapped with wood grain wrap which is strong and durable. The New Town flip top dining table offers a convenient solution for homes where space is limited. Providing enough space for four people when closed and six when extended, you can quickly transform your space to entertain in style. The chunky effect gives this table a really strong and sturdy look. With a modern design, this dining table suits most decors and styles. The light oak finish helps to produce an illusion of space, making it the perfect solution for smaller spaces. Extremely easy to open, the designer chrome hinges add a touch of class to this table. Easily opened by just one person, you can produce dining space for up to six people in no time. This item is delivered flat-packed and requires self-assembly. 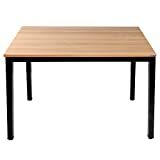 Even more suitable for smaller homes, you can easily move this table into the right room upon delivery. We recommend two people work together to assemble this item. Dimensions: L100 * W60 * H75 cm; Desk weights about 14.2kg. Panel Material: 18mm E1 graded solid particle wood board, anti- scratch & wear resistance, easy to clean. Metal Frame: 40mm heavy-duty powder-coated metal, strong enough to support heavy devices. Height Adjustable 1-2 cm for leg, keeps stable on uneven floor. Easy to assemble, just install 4 legs with 8 screws. Simple design but multi-function, can be used as kitchen table, dining table, computer/study desk, work table & etc. Dowels or dovetailing are both signs of good construction. Also, check to see if the table surface is solid oak, or if it is an oak veneer over composition wood. If it’s veneer, it could still be fine–solid oak is VERY expensive–but make sure that the veneer is not too thin. Checking the edge of the table should show about 1/16″ of veneer. Any warping in the surface, or gaps along the edge where veneer has come unglued, are warning signs. Comfort is another checkpoint. No one sits ON the table, but they DO sit around it, and it should be at a good height so that it neither bumps into anyone’s knees or makes anyone have to reach too high for eating, writing or other activities. Pull a chair up to the table and pretend to eat: it might look silly in the furniture store, but it’s better to look silly than to buy a table that doesn’t work out at home. Oak dining tables, with their adaptability and durability, are among the best choices for either a modern or traditional home. A bit of care and consideration when buying the table will pay off–a high-quality table will serve the household for generations.